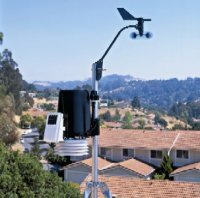 A wireless weather station with a versatile sensor suite that combines rain collector, temperature and humidity sensors and anemometer into one package. 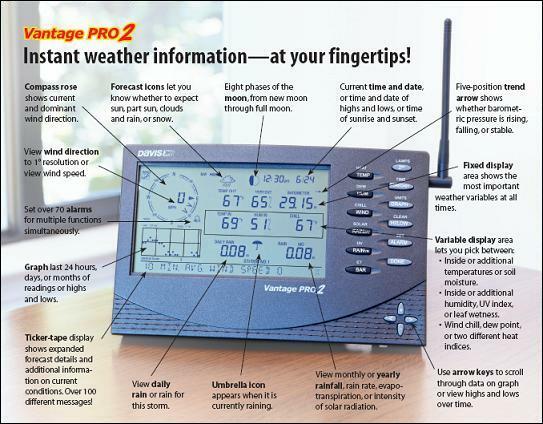 You can customize your Vantage Pro2 by adding consoles or the special-purpose options. Available in 3 sub-versions being Wireless (6162AU), Wireless Fan Aspirated (for increased accuracy-6163AU) and Cabled version (6162C). First and only weather station in its class to use frequency hopping spread spectrum radio technology to transmit weather data wirelessly up to 300m (1000') in flat terrain and ~75m-150m in urban environments. TIP:- Don't forget to add a #07717 Mounting Pole or #07716 Mounting Tripod with your station purchase. Wireless range is up to 1000' (300 m) outdoors, line of sight. Typical range through walls under most conditions is 60 to 120m (200' to 400'). Add wireless repeaters for distances up to 2.7 km (1.7 miles).